AAAC has recently revised its online training module for new evaluators. This module has existed for more than 10 years, but over the past several months, it has been updated and refreshed. Designed for AAAC members to provide to their onsite visitors/peer reviewers/evaluators as a resource for orientation and education with respect to conducting accreditation reviews. Consists of seven modules: Overview of Accreditation, Steps in the Accreditation Process, The Evaluation Team, University Culture and Professional Ethics, Evidence Gathering, Interviewing, Reporting. Each module includes self-assessment quiz questions throughout. Final exam at the end of all the modules. 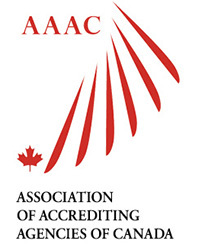 Developed as generically as possible, so as to incorporate the principles and the accreditation processes of as many AAAC members as possible. If your organization is an AAAC member, and you are the primary contact person, you can request free access to the course to review it and see its applicability for your context. This access must NOT be shared. The fees charged for access are an important revenue source for AAAC annually. Instructions on how to purchase access for your evaluators. Please click here to view the webinar slides and the webinar recording that took place on October 5, 2017 for more detailed information. Register online to purchase "learning credits" for one learner at a time or for several at once. You will pay $85 + HST for each learner to access the training. If you would prefer AAAC/Megram to manage your organization's credentials rather than doing it yourself, this service is available for a $5 fee. Both English and French modules are fully operational. A certificate is awarded at the end of successful completion. If you are not a member of AAAC and would like to take this course, the fee is $150 + HST. Please email Jenny Blake to make arrangements.